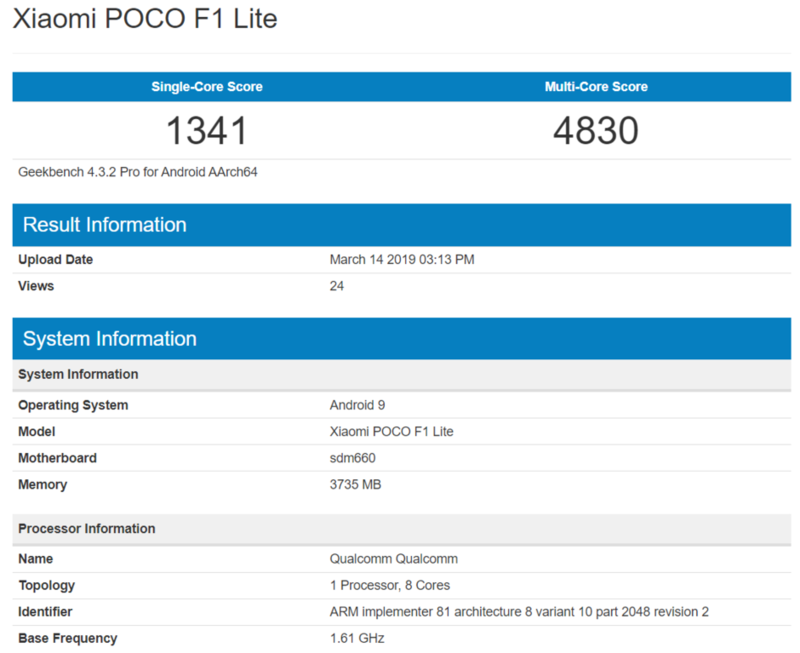 Xiaomi Poco F1 Lite Geekbench Listing Appears to Reveal Key Specs - Playfuldroid! The Poco F1 Lite Geekbench listing reveals that the phone is equipped with 4 GB of RAM and Snapdragon 660 chipset. The smartphone is loaded with Android 9 Pie OS. In the single-core test, the Poco F1 lite has scored 1341 points. It has recorded 4830 points in multi-core test. There is no official confirmation on the existence of the Poco F1 Lite smartphone. The SD845 powered Poco F1 comes with 6 GB of RAM and 64 GB of storage in its base model. There is no other information on other specs of the phone. Probably, the smartphone could be equipped with same specs as the original model and it may only differ in RAM and storage sizes. In India, the Poco F1 is selling for Rs. 19,999 ($289) for the base model. Hence, the Poco F1 Lite could be available for around Rs. 9,999 ($148).